thenobodies80 wrote: Just a quick thought while I take a coffee at work...graphically speaking it looks really great, I strongly suggest to use always PS if the above is the result you can achieve using it. Finally I notice that you have a couple of short line that are a bit hidden behind the hats(? ), like B FOR - BR REC for example. Final Note, if you want to go BR, remember that , if approved, this map will be ONLY for battle royale. On that side it would make more sense to me to have this one as standard map and instead go with a World Rail Map (just an example) for battle royale...in that way you will have a series of rail maps and a final BR maps to complete the series....obviously these are just random thoughts. The coffee break is taking too long...maybe it's time for me to go back to my RL work. Again it looks very nice. 1. Better drop shadow given behind the rail lines to make them stand out more...i think this is better than changing the line colours...this map because of the dark sea can cope visually better with darker drop shadow than could Rail Africa. I will have to consider more the BR situation. cairns, I want to get this sent on. Have you considered everything that you want to and as before with the new rules in place, do you want this one stamped? As soon as I have that answer, I will move you up the food chain. koontz1973 wrote: cairns, I want to get this sent on. Have you considered everything that you want to and as before with the new rules in place, do you want this one stamped? As soon as I have that answer, I will move you up the food chain. Koontz. there will be no BR for this map, i have made the adjustments as suggested by tnb, so yes, move it on up if you consider it worthy. Here you go cairns. Onwards and upwards. Have fun. Cairns, I really like how this looks. This is the nicest looking Rail map I think, only maybe behind USA or Europe. Gilligan wrote: Cairns, I really like how this looks. why not remove the central america line? as well as not being part of south america, the inclusion of central america detracts from gameplay by creating a tiny bonus in a corner of the map. to keep the number of non-neutral stations at 104, it's possible to add Campinas Z north of SAO and Curitiba Z west of SAO (which are stops on the proposed high-speed TAV lines) to the heavily-industrialised southern part of brazil to make it look more developed. If Curitiba Z is already there as BFH (i don't know this abbreviation), then maybe add Florianopolis Z, south of BFH. BRR is labelled as U. is it supposed to be O? iancanton wrote: why not remove the central america line? 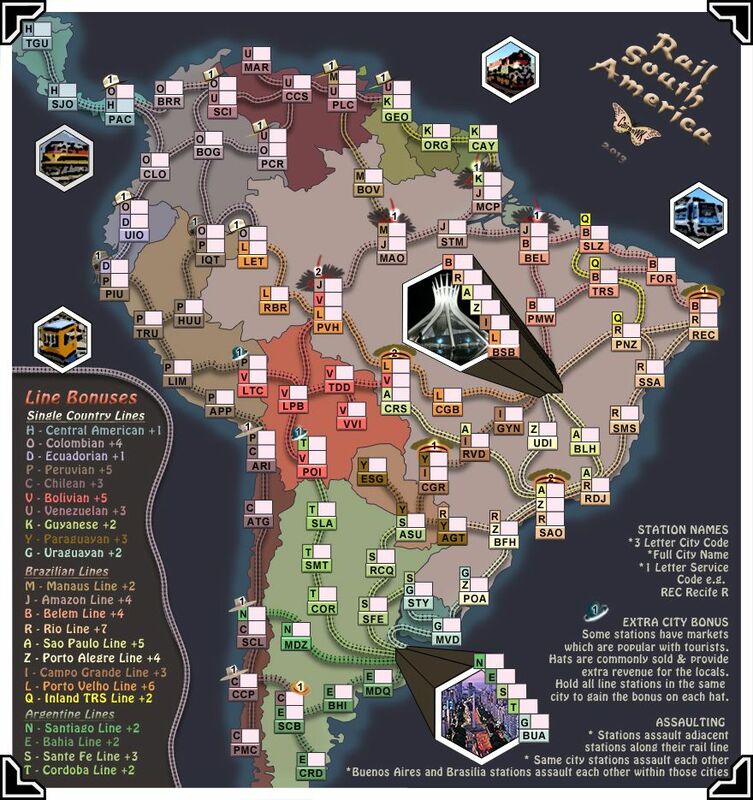 as well as not being part of south america, the inclusion of central america detracts from gameplay by creating a tiny bonus in a corner of the map. to keep the number of non-neutral stations at 104, it's possible to add Campinas Z north of SAO and Curitiba Z west of SAO (which are stops on the proposed high-speed TAV lines) to the heavily-industrialised southern part of brazil to make it look more developed. If Curitiba Z is already there as BFH (i don't know this abbreviation), then maybe add Florianopolis Z, south of BFH. and particularly more so since i am now not allowed to develop a north america map since being told this is the "last" rail map. no...i think having a little "3 station start" region there is good for someone to gain a foothold, the same as they can do in these other regions i have identifed with 2.5 / 3 / 3.5 stations...spreading them somewhat around the map...1 count there are 7 regions like that alredy existing. and call it the Q (or F) line to serve the heavily inland regions around Teresina..as below in V9a. So really i am not in favour of that. the fact that central america is not part of south america is not irrelevant at all. there are no rail lines between panama and colombia, nor even a single road. the panama-colombia border is therefore the natural place to cut off the map. it does detract from gameplay and so does adding an 8th tiny rail line bonus. this is a huge map which does not need so many bonuses that are smaller than the ones in classic (and we haven't even started talking about the hat bonuses yet). that area is heavily industrialised, while large parts of south america are wilderness, therefore it ought to have a greater density of stations than the wilderness areas. well my counternace is that i didn't say the map was based on reality...in fact if you care to examine some of the other rail series maps, you'll see there is quite a bit of non-reality on there also with many lines. so i once again say it is irrelevant. who said my maps were based on classic. Seems to me you base everything on classic, and for my 2c worth, classic is not all it is made out to be. i think that by having 8 little pockets of smaller rail bonuses, it would help everyone in a larger games to gain a foothold, and therefore to my way of thinking, would help balance gameplay somewhat. i don't care if it is heavily industrialised...as per the top, i am not necessarily basing everything on reality. i didn't do that in my last rail maps, and i won't do that in this map just because you think it is important enough. to me graphic eye space is far more important. So rather than argue the beejeesus, how about we start getting dow to the tin-tacs of discussing the bonuses, and hats. Map looks great. While I don't mind Central America being included (regardless of the 'reality' of it) I'm just a bit bothered by the fact the "Central America Line" is listed as a "Single Country Line" when it is of course not a single country. It's a very small thing I know but bothers me a little. Also I'm not sure I like the hats--seems a bit of an unnecessary gimmick that adds clutter to the map. What about adding a line of territories down the ridge of the Andes that would not be stations but rather 'lose x armies per turn' neutrals (similar to the one that cross the ice sheets in the Greenland map) to reflect the difficulty of traversing the mountains? If you wanted you could add a few of them through the heart of the Amazon region as well as that's also a very difficult area to travel through. If it's extra touches you want for this map, I think I'd prefer those to the hats. As I said though, map looks great and I look forward to playing it whatever you decide! perchorin wrote: Map looks great. While I don't mind Central America being included (regardless of the 'reality' of it) I'm just a bit bothered by the fact the "Central America Line" is listed as a "Single Country Line" when it is of course not a single country. It's a very small thing I know but bothers me a little. perchorin...i can understand your viepooint, but like other maps some artistic license is employed even in "Stalingrad" and sometimes it is impossible to reflect reality for gameplay sake...this is one of those. Can i ask why you think it clutters the map. I'm not on board with this idea of losing an army turn because of terrain...railways are meant to overcome those things and are more subject to weather conditions like floods if they're not built in the right places - which i am sure the builders would probably do given we have new wonderful technologies to allow for those events. If you can come up with another reason to "lose an army per turn", i'd better consider that. The other thing is putting a line of place/stations down the Andies spine would create a very cluttered space indeed. I'm also still not sure you've justified enough reason to lose the hats....and at present you're the only one wanting to do it. i don't want to sound too negative but thanks for your post, i appreciate giving your thoughts even though i am not on board with them. I've added propery the small yellow Teserina line into Brazil. 1) "Colombian" is spelled incorrectly. "Columbian" refers to Christopher Columbus, but "Colombian" refers to the nation. 2) "Guyannian" isn't a word. "Guyanese" would be the right word there, unless you want to stick with the made-up word for consistency's sake. 3) Shouldn't it be "Central American" rather than "Central America?" You're using the adjective for all the other "single-country" lines, but then have the noun for Central America. 4) I'm confused by the hats. I'm sure it's explained in this thread, so you can accuse me of being lazy for not reading through. But the fact is their purpose needs to be apparent just from reading the map. It says "hold all stations to gain the bonus." Well, what is the bonus? The number on the hat? If so, I can't understand if those are 7s or 1s on some of them. And you say all stations but I think you mean "all stations that have the same hat" as there are multiple types of hats and I can't imagine you need all of them to trigger a single bonus. Or maybe you mean one of each hat? It's very confusing. I'm not saying it needs to be scrapped, but it definitely needs to be explained better if it's going to be a key part of the map. 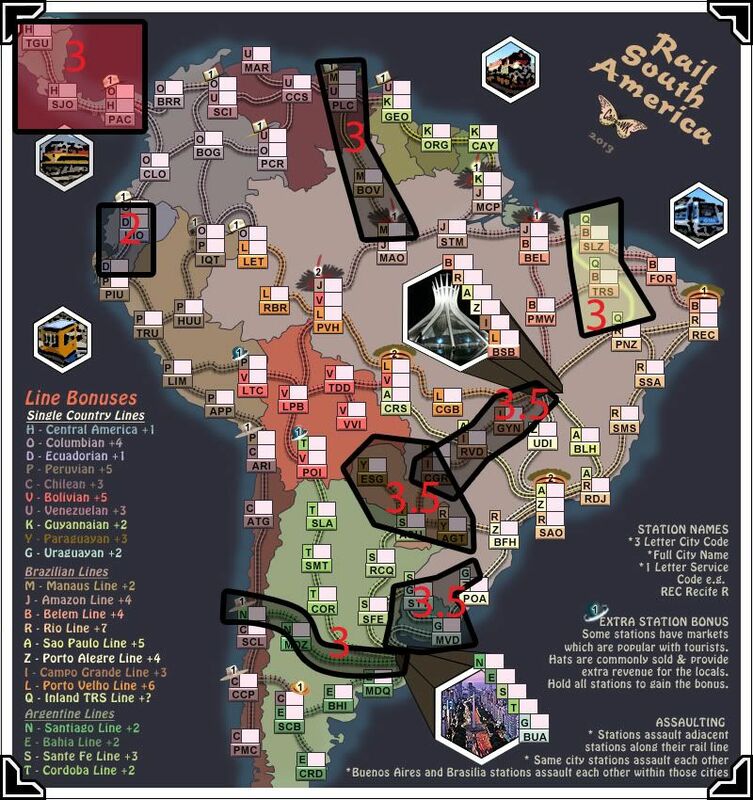 I personally do think it's a little gimmicky and takes away from the awesome nature of the rail gameplay (I prefer Europe, Africa and Asia to the Australia Rail map, in the interest of full disclosure), but it is of course your decision if you want to use them. At the request of the mapmaker, this map has been placed on vacation for a period of 6 months. After the 6 months the map will be considered Abandoned. 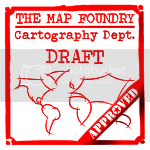 If the mapmaker wants to continue with the map, then one of the Cartographer Assistants will be able to help put the thread back into the Foundry system, after an update has been made. Thanks Peter, sorry so long to reply. Well Peter, there hasn't been feedback on this so far, i'll leave it and see what others think. I've changed the wording to "Hold all line stations in the same city to gain the bonus on each hat". Version 11, with fixes from above and also new hat on GCR. I've added a rail line as the edge on the bonus legend. Great to see you back in this Cairns! initially i was unimpressed with the hats but i think they can grow on me.